Welcome to the WDRC Website! 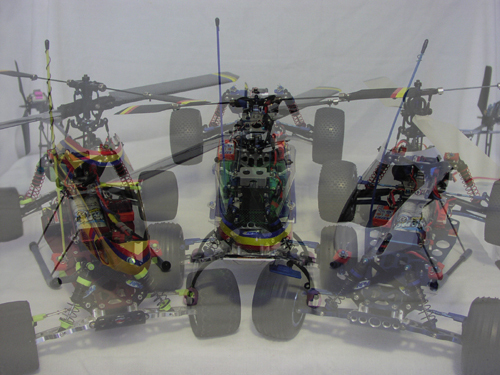 It all began with the restoration of a MRC Hornet R/C Buggy and a used $30 Rustler. The Hornet, after an unfortunate demise, quickly gave way to a Traxxas Bandit, which was joined by a used Kyosho Optima (4WD). What, originally started as "Ya know, it would be fun to have a couple of R/C vehicles to mess around with!" turned into a very intense family hobby coupled with an insatiable quest for more speed! The Rustler, well the Rustler took on a life of it's own, found Novak and GM Racing, sought counsel from TheJANG (Ultimate Traxxas) and became a 65mph, wheelie popping, active-winged, terror known infamously in the neighborhood as ........... THE WICKED DRAGON! Parts were really hard to find for the Optima, so it got converted with Traxxas parts to a 2WD and after getting run over by our neighbors Jeep, ended up as an incredibly fast hybrid, sort of an Indy style Truggy! The Bandit went through a transformation too. From an off-road buggy to a street racing Truggy, then to a full-blown Rustler. Family interest grew and the Lil' Dude Rustler was added to the mix along with the awareness that organized R/C racing actually existed. With the discovery of ROAR (Remotely Operated Auto Racers) came the need to conform and follow the rules. THE WICKED DRAGON Rustler was now destined to become an eStock Truck but the other 3 Rustlers........... definitely MODIFIED! The projects began, research was done, acquisitions were made, parts were designed and fabricated, testing commensed. While working on one of the trucks with my son watching, I made the comment that it was almost like working on a real race car. My son replied "It is a real race car, only smaller!" The light bulb went on.........WDRC Engineering and TEAM WICKED DRAGON were born! With the expansion of our R/C interests, WDRC Engineering has expanded too. We've branched off into R/C helicopters, airplanes, and model rocketry. Heli's, Park Flyers, Sport, 3D and EDF Jets.......the aircraft and flight projects will also be shared and documented on the site.